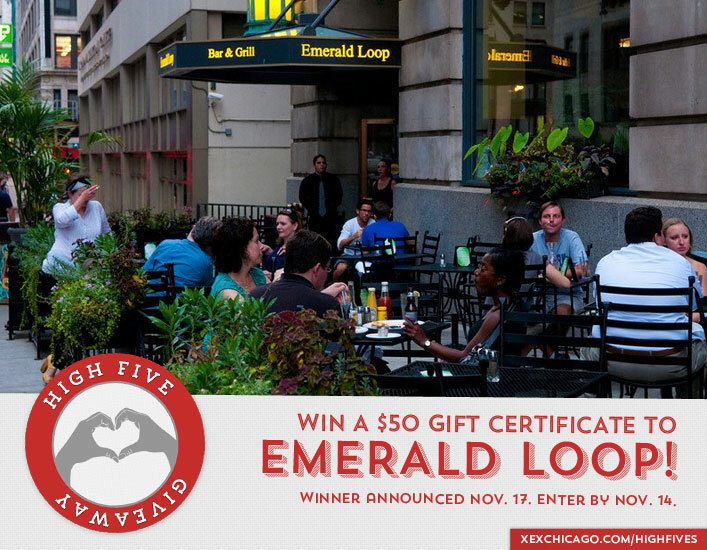 Win a $50 Gift Certificate to Emerald Loop! Congratulations to Jesse Bostic on winning our 108th High Five Giveaway! Thanks to all who entered. For our next High Five Giveaway we have a $50 gift certificate to Emerald Loop. Emerald Loop is a Chicago Irish Bar & Grill known for its Prime Burgers, Big Salads, Irish Food and a large craft and import beer selection. Emerald loop is great stop for lunch, after work happy hour, dinner, late night fun and for watching sports and has a large beautiful Sidewalk Café for Al fresco dining. Breakfast Buffet every Saturday and Sunday. It is located at Wacker and Wabash – steps from Michigan Avenue and the River. Emerald Loop is located at 216 N Wabash Ave, Chicago, IL. Visit their website at www.emeraldloop.com or call them at 312.263.0200 for more information. What is the name of an Aveda product that is helps dry or brittle hair? Hint: Check our our latest blog post for two possible answers! Now, just add a comment to this post with the right answer to be eligible to win! The winner will be announced on Monday, November 17. Enter by midnight on Friday, November 14! Botanical Therapy Damage Remedy Conditioning Treatment! Aveda’s Botanical Therapy Damage Remedy Conditioning Treatment – Which I have and LOVE! Aveda’s Dry Remedy- which I have and love! the botanical therapy damage remedy condition treatment! Botanical Therapy Damage Remedy Conditioning Treatment is a great option! Aveda’s botanical therapy damage remedy conditioning treatment! !